Dancing, especially the tango, can be the ultimate aphrodisiac. And even those with two left feet can learn the skills to sweep their partner off their feet. Join us on Friday, February 16 (8pm) for Tapas & Tango at Arthur Murray Dance Studios in Lake Mary (840 Currency Circle, Lake Mary) for a night of dancing, great food, wine and most of all, FUN! Designed to delight dancers from beginner level to experienced, this event will give guests the chance to learn the basics of Argentina’s famed forbidden dance. 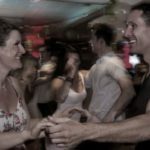 In this lively, judgment-free zone, we’ll begin to master some steps on the dance floor via the masterful guidance of Arthur Murray’s instructors. Of course, wine always helps to break the ice when trying something new or outside of our comfort zone. We’ll have plenty, starting with a welcome glass before we get things started. In addition, delicious tango-inspired tapas will be served throughout the evening. Tickets for this event are just $30 per couple, including food and wine. Absolutely no experience necessary. Hurry… tickets won’t last long.